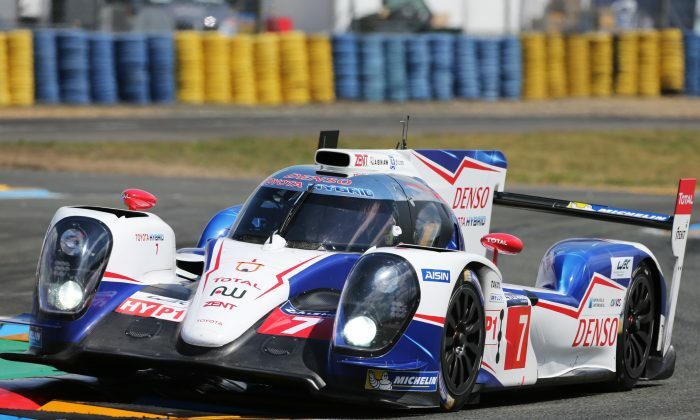 One third of the 82nd Le Mans 24-hour race is done, and Toyota leads as it has for most of the race. With 120 laps run, the #7 TS 040 driven now by Kaz Nakajima has almost two minutes on the #2 Audi R18 e-tron quattro of Marcel Fässler and another minute on the third-placed Audi of Marc Gené. Toyotas brought two of its TS040 Hybrids; Nicolas Lapierre wrecked the #8 in the first two hours when a sudden rainstorm deluged the track. The crew needed nine laps to get the car back on track, but when it returned it was extremely quick—until it went back into the garage near the eight-hour mark. The car rejoined again after 15 minutes, but is no so far down there is no chance it will influence the overall standings. Audi brought three R18 e-tron quattros; one was taken out in the accident which damaged the #8 Toyota. The other two run second and thirds, but bad luck with safety cars coupled with slightly slower lap times have given the leading Toyota a comfortable lead. The Audis are proving able to quadruple-stint their tires, which should save half a minute ion three out of four pit stops compared to the Toyotas, which have been running the tires for two stints. Toyota has to push harder to keep its gap to counter the Audi’s greater efficiency, which increases the chances of mechanical failure. Audi is as quick as Toyota on fresh tires, and can go almost as fast on used tires. Over the coursde of 16 hours, those few seconds could mean victory. The #20 Porsche 919 Hybrid, which traded the lead with Toyota for several stints, has dropped off the lead lap. The #14 Porsche is five laps down after having engine trouble early in the race. Both Porsches have gone off at Arnage corner, the #20 three times, suggesting that the regenerative braking for the energy harvesting system might be out of balance at the slowest corner of the track. Aston Martin Racing has shown its might as night has fallen. The #97 GTE-Pro vantage driven by Darren Turner has taken the class lead from the previously dominant #74 Corvette, while the pole-sitting #51 AF Corse Ferrari of Gianni Bruni came back from fifth to third in class, passing the pair of Manthey Porsches and threatening Olly Gavin in the Corvette. The second Corvette, the #73, lost time in the pits with a broken air-jack valve and has dropped to seventh in class. In GTE-Am it is the #98 Aston Martin racing piloted by Pedro lamy leading from Nicki Thim in the #95 Aston, a lap ahead of the #72 SMP racing Ferrari. Jann Mardenborough in the #35 Oak Racing Ligier-HPD leads LMP2, but his lead has been shrinking. Tristan Gommendy’s Thiriet/TDS Ligier-Nissan has been cutting the gap to Mardenborough, with Franck Mailleux in the Race Performance Oreca-Judd moving ahead as well. Despite eight hours having passed, the race has barely begun. Drivers have to keep focused through the dark, driving into a sea of darkness with a sea of light in their mirrors, picking out braking points and apexes based on memory and whatever shifting reflection. As the night gives way to dawn, drivers have to fight the rising sun, while the cars have to fight 18 hours of constant abuse. The final several hours are the toughest on car, crew, and drivers; it isd easier to make mistakes and more likely that the various mechanical systems will fail. It is in the final few hours that the hardest racing takes place, as teams see what they can realistically fight for and go as hard as they can for as much as they can get. To get to the final hours, to even get to dawn, the drivers have to manage their cars through tight traffic and down long, dark tree-lined straights at 180 to 220 mph, lap after lap, hour after hour. Follow the race on Fox Sports TV, and Radio le Mans.com, with Live Timing and Scoring at http://live.fiawec.com.